Rows 1, 3, 5, 7, and 9 (WS): Purl. Row 2: [K1, yo] twice, sl1-k2tog-psso, k3, k3tog, [yo, k1] twice. Row 4: K1, yo, k3, yo, ssk, k1, k2tog, yo, k3, yo, k1 (15 sts). Row 6: K1, yo, ssk, k1, k2tog, yo, sl1-k2tog-psso, yo, ssk, k1, k2tog, yo, k1 (13 sts). Rows 8 and 10: K1, [yo, ssk, k1, k2tog, yo, k1] twice. With two horizontal repeats on display, row 3 results in 18 stitches. Yet the written instructions note that row 3 results in a “multiple of 9 sts.” That could be 9 stitches, or 18, or 27, or 36, or... you get the idea. Row 1 (RS): *P1, ssk, [yo, k1] 3 times, yo, k2tog, p1, repeat from * (multiple of 11 sts). Row 2: *K1, p9, k1, repeat from *. Row 3: *P1, ssk, k5, k2tog, p1, repeat from * (multiple of 9 sts). Row 4: *K1, p7, k1, repeat from *. 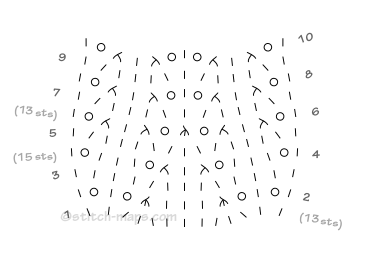 In general, when noting a change in stitch count, Stitch-Maps.com will use phrasing like “15 sts” if that row will always result in 15 stitches. Otherwise, it’ll use phrasing like “multiple of 9 sts,” “multiple of 10 sts, plus 1,” or “3 more sts.” These stitch counts indicate the number of stitches created by working a given row. When short rows are involved, that’s not necessarily the same as the total number of stitches on the needles, as it doesn’t take “dormant,” unworked stitches into account. Makes sense, yes? Do you need to include these stitch counts when entering knitspeak? Of course not! At Stitch-Maps.com, the goal is to make it easier for you to visualize, analyze, and understand your stitch patterns. Enjoy! Brackets, braces, and parens, oh my!